Today is a fun day. Now this happens quite often and some people will always tell you that this world is going to endList of apocalyptic events – Wikipedia. This isn’t much different from the guy on New York Times Square with signs hanging from his shoulders, telling us that “The end is near”. But there is a difference to all the other prophecies. It’s not that the Mayans or rather the New Age guys were right, the big difference is that Roland Emmerich learned that “Catastrophe sells”. The day after tomorrow was the first step, taking every scientific inaccuracy he could find and exaggerate it into a vicious nature defending itself against those evil humans. It worked, people loved the story and personally, I think it’s a fun movie to watch. The next movie Roland Emmerich decided to be a good idea, was “2012” and marketing decided it was a good idea to do some viral marketing. Consequently, it went viral and a lot of people started believing in the 2012 myth. The movie itself was a catastrophe of its own. It wasn’t quite as much fun as the Day after Tomorrow, but it contained just as much pseudo-scientific trash. The reaction to the movie was so huge that NASA launched a website busting the most common mythshttp://www.nasa.gov/2012. The most common ideas of a world coming to an end, include a couple scenarios, most of them inspired by the movie 2012. 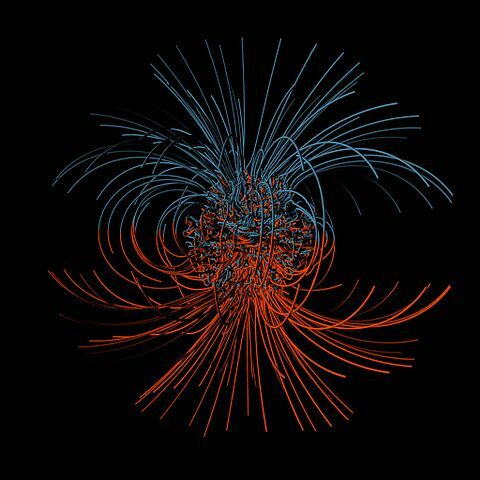 Magnetic field lines of Earth’s magnetic field. Early in school we learn that our Earth has a magnetic field. We can use a compass to find our way back home we usually explain this with a normal magnet that everyone can relate too. It’s easy and we can understand it quite good, but unfortunately this analogy is wrong. Earth has an inner core that to a large part consists of Iron, however the core is not a permanent magnetMagnetic Field of the Earth. It would’ve been such a nice and easy explanation and now we have to explain it in some different way. This explanation includes the hot iron currents in the outer core that function as a coil and some source providing an electric charge. These circumstances causes magnetic induction that creates a strong magnetic field. However this field isn’t a nice clean magnet with two poles at each side, a so-called dipole. A small part of this magnetic induction creates different poles that make up a so-called multipole. These don’t affect us in normal life, but it might show you that Earth’s magnetic field is more complex than that elementary school analogy. Now we’re getting to the geomagnetic reversal. This is something that happens every couple million years and it will happen again. However, we need to realize that Earth is a patient lady and takes its time. This geomagnetic reversal takes up to 10.000 years, which is about the time the Holocene started to now. 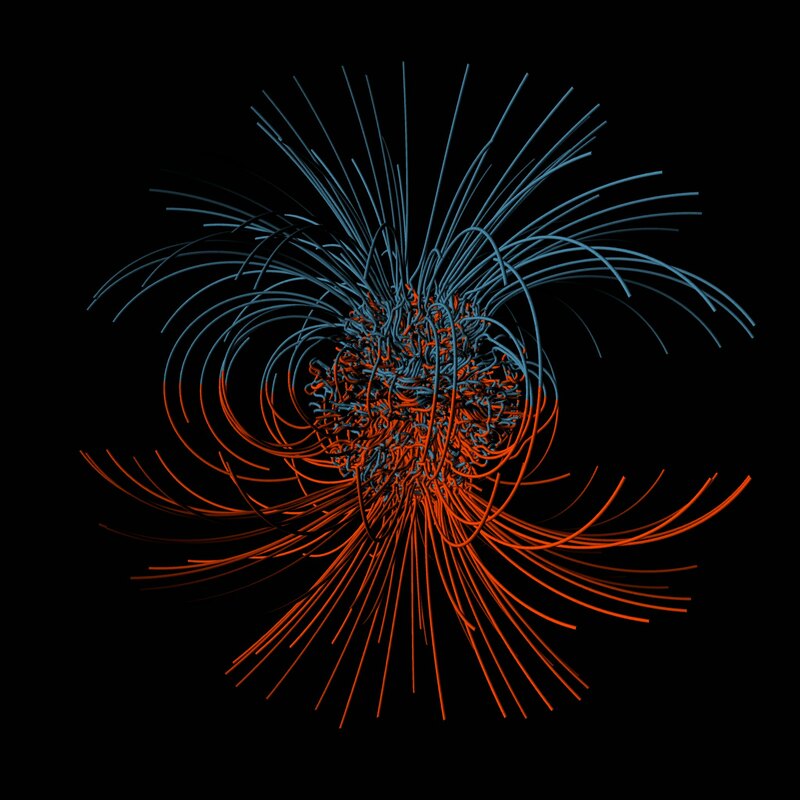 During this time the magnetic field becomes chaotic, it doesn’t just disappear. So even if a geomagnetic reversal “started today”, we wouldn’t realize because it is a slow process and happens gradually. Additionally, it wouldn’t be the end of the world. But just for the sake of argument, what if the geomagnetic field would just disappear? Studies suggest that the flux of solar plasma into the ionosphere would induce a new magnetic fieldhttp://dx.doi.org/10.1051/0004-6361:20040154. Additionally, this would probably give us some spectacular auroras. This was a pretty spectacular image from the 2012 movie. The tectonic plates started breaking up like ice floes but instead of water there was hot molten rock underneath. I believe this stems from a deep misunderstanding of Earth’s mantle, volcanism and how rock turns into magma. Let’s start out with Earth’s mantle. We know that tectonic plates, making up the crust, float on Earth’s mantle. Driven by convection of the mantle these plates move. Now this is pretty clear but from this point on there is something a lot of people get wrong. Earth’s mantle is NOT fluid. Don’t get me wrong here, I even had a lecturer at university tell me that Earth’s mantle consists of fluid magma. But this is entirely wrong. We know this from a simple fact that a certain type of waves does not exist in fluids, they’re called shear waves. We can measure these waves traveling through Earth’s mantle after every earthquake that is strong enough to send some waves down to the mantle. Now we have to talk about magma. Since the mantle doesn’t consist of magma, we get a little problem explaining volcanism, right? Yes indeed at first sight we’re at loss, but when we look at it closer, we get even more processes under which magma develops. This graphic show three processes under which magma develops and compares the according graph to the normal geothermal gradient. On the very left we see how the red line does not cross the green “solidus”-line. This is the normal state where rock stays solid. The second graph shows the condition of mid-ocean ridges. This happens when tectonic plates drift apart and hot rock rises just to lose pressure from the crust above, which causes the rock to melt at comparatively low temperatures. The third graph shows a hot spot, which would be the classical idea of volcanism. 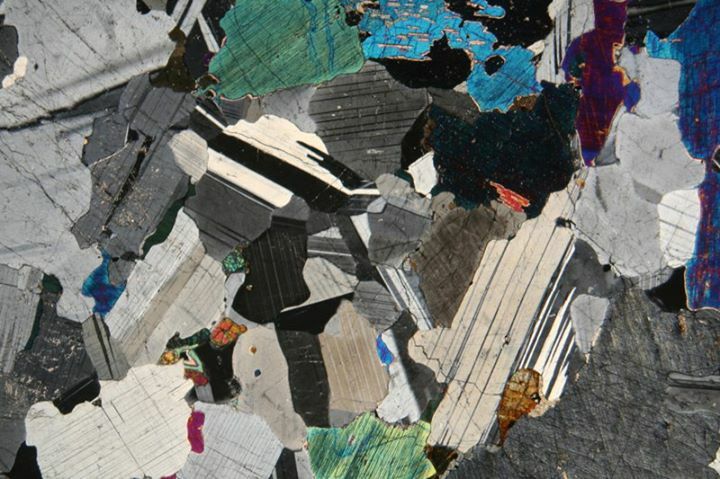 Hot material from below rises and heats up the crustal rock. If you look at the graph, the temperature is at least 200? hotter than the mid-ocean ridge temperature. We find this kind of volcanism on Hawaii, where a hot mantle plum heats up the crust. 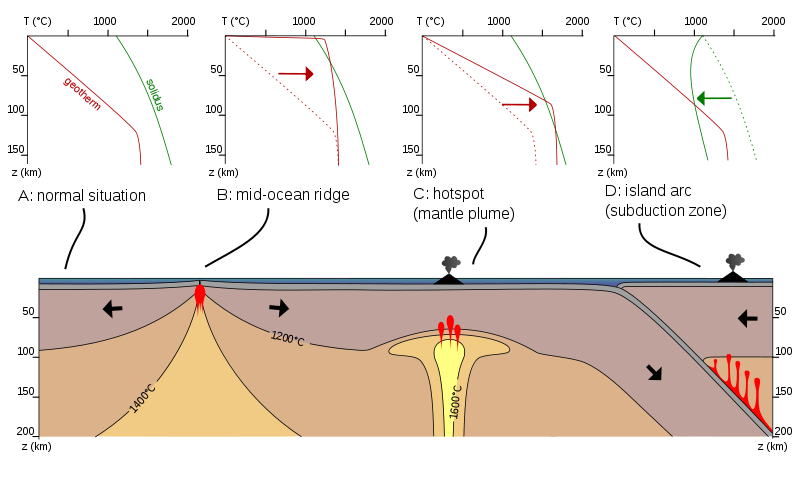 The fourth graph is an example of volcanism at subduction zones, where a tectonic plate dives under another plate because of converging motion. We see that the temperature gradient is just like the normal gradient but our melting point is shifting down. This is an effect that comes from the subducting sediments. They carry different gases like H2O or CO2 that decrease the melting point of the surrounding rock, making it melt at even lower temperatures. We can observe this behavior at the Andes in Chile. Now if we think about it, the entire mantle was molten in the movie, breaking up our crust. Since we cannot blame a mysterious source of H2O or CO2 in the ground and pressure is a direct effect of gravitation, the mantle would have to heat up by itself in the hot-spot way. This would require some amount of energy. Let’s play this gedankenexperiment through. If we assume a specific heat capacity of the mantle of 914 J/(kg*K)Wheeler, J. (2005), Geodynamics by D. L. Turcotte and G. Schubert. Cambridge University Press, 2002. No. of pages: 456. ISBN 0 521 66624 4 (soft covers). ISBN 0 521 66186 2 (hardback). Geol. J., 40: 246. doi: 10.1002/gj.987 and a mass of 4,08 ? 10^24kg, it would take 3.73?10^27 Joule to heat up the mantle by one degree. This is equivalent to an explosion of 892 petatons TNT. I don’t think anything that induces this heat in the mantle would leave much life on the surface to suffer through the apocalypse, if you know a way, feel free to leave a comment, but remember that we need more than one degree to actually have the mantle start melting. But we can work a bit further with this gedankenexperiment. This energy source would induce such an amount of energy that the mantle would expand by 87m to every side, considering a thermal expansivity of 3 x 10^-5 K^-1. This might have the effect of a boiling egg, where the crust cracks open because of inner expansion, throwing us into the scenario of the decompression melting at mid ocean ridges. Nevertheless, we would still need this enormous energy coming from nowhere all of a sudden, leaving all life on Earth intact to have them suffer a violent magmatic death. Kind of unlikely, if you ask me. This kind of thing cannot happen all at once. You know this from the kitchen, when cooking potatoes, you cut them up to get dinner ready in time and Earth is quiet a big potato to cook all at once. So how do we know, we’re not at the end of the heating process and tonight the cracking of the crust starts? Well, thermal expansion would be a process that happens along the way, while heating and satellite grids did not pick up any expansion of the Earth. If for some reason no thermal expansion happened and the mantle was just melting under our feet, we would’ve picked this one up as well. You might remember me telling you that there are certain waves that cannot travel through fluids? On December 9th, an earthquake of magnitude 7.3 happened in Japan and all the waveforms arrived as expectedEarthquake Summary for 09. 12. 2012 in Japan M7.3 – USGS. If you want to have a look if seismicity did actually increase over the last time, head over to the data of the USGS and have a look at the real-time map. Concluding, I would say I still feel safe on this planet and you can too. Nertheless, remember it’s Friday and there are some great apocalypse parties going on. Just don’t get yourself into some suicide cult party that might be awkward. Enjoy the end of 2012, the end of the world is still a bit into the future. How geologists view the world. Breathtaking View of a Breathing Earth Awesome thin-sections How to see the earth rumbling. Posted in Communication, Earth Science, Humor and tagged apocalypse, humor.